GoBike Consultations Digest, Issue 1, 23 January 2018 – Scotland wide! Consultations to which GoBike has responded. Upcoming consultations, for which we welcome your comments as to how we should respond, but we will also include here consultations for which you, as an individual, are asked to respond. So we will be giving you far more information than we have in the past and we hope that this will encourage you, as GoBike members, to not only give us your views as to how we should respond but also to put your views directly to the organisation that has issued the consultation. See also our Consultations page on our website. 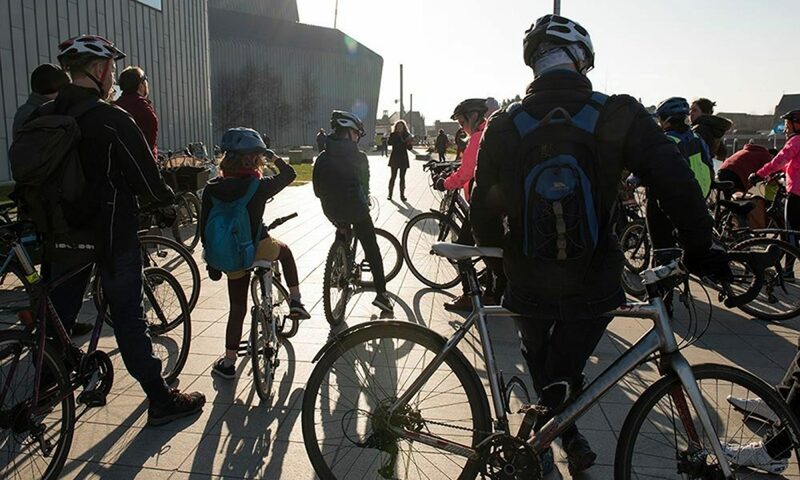 We have also, 22 January, responded to an on-line survey from CyclingUK, who are looking for how the central organisation can help its affiliated groups, such as GoBike! Many of us are CyclingUK members, probably for the insurance and the UK-wide news, rather than its campaigning input. There’s potential for further expansion into Scotland here. If you are a member, keep a lookout for the response summary. Port Dundas Constrolled Parking Zone Amendments which introduces 9 parking bays into this area of the city that the council is developing. If you do know the area and have any comments please get them to us, and to the Council – but responses must be received by Friday, ie 26 January. Silverburn to Newlands, amendments/completion of the cycle route. This route, primarily shared footway, was started in Spring 2015 but never completed. We now hear that it’s on the move again, but, for those of us on our bikes there will be multiple steps to be taken to negotiate junctions! Discussion is just starting on our Slack channel and we will give more information as soon as we can. And a third point, for information, is that 2 of us from GoBike plus 2 from Space4people Byres Road, will be meeting the consultants for the changes to make Byres Road more people friendly tomorrow, 24 January. Transform Scotland have told us about 4 consultations, for which either an INDIVIDUAL or a WORKPLACE response is appropriate. Please do get your views in. As part of the Council’s Parking Action Plan a review of parking permits in Edinburgh is taking place, with the aim to improve air quality and enhance quality of life. This consultation seeks views from people living, working or visiting Edinburgh on the proposal to apply a surcharge on parking permits issued to owners of diesel vehicles. Find out more and respond here. The Scottish Government has launched a consultation on their actions and ambitions on diet, activity and healthy weight. This consultation mainly focuses on actions to improve people’s diet and health, but there are some questions relating to physical activity and how to get people more active. You can read more and respond here. The aim of the Challenge is to get people thinking about how they travel and to encourage people to commute by walking, cycling and public transport (there’s prizes to be won!). To sign up and find out more, please see the Commuter Challenge registration page. Sustrans Scotland want to get as many people as possible travelling to and for work by walking, cycling, public transport and lift-sharing. Anyone who works for an organisation in Scotland can take part in the Workplace Journey Challenge, and Sustrans will be giving out loads of prizes along the way. Register, find out more and share with colleagues here. “I can advise that, thought was given to all road users when designing the traffic calming measures on this section of road. The decision to incorporate speed tables into the design was done to improve the pedestrian crossing provisions on this stretch of road as well as reduce the speed of all traffic. In addition to the above, I can advise that the proposals do not include any vertical calming measures between White Cart Water and Camphill Avenue and as such cyclists travelling on this incline will not have to negotiate any speed tables until the gradient levels out to the north of Camphill Avenue. Further to this, the proposed speed tables will be constructed with a 1m ramp so inconvenience to cyclists will be kept to a minimum. Work has started on the Sauchiehall Street improvements, which we are delighted to see, but back in February 2017 we expressed our objection to Elmbank Street being made one-way, with no contraflow cycle lane, instead of the current two-way. On 20 December GCC replied to us to say “ In this instance the Project Team determined that the provision of a contraflow cycle lane would present issues in terms of health and safety and therefore the decision not to implement was taken.” We have asked what the health and safety concerns are, given that there are so many instances within the city of contraflow cycle lanes – the 3 we quoted are all in the city centre: Gordon Street, Argyle Street and Howard Street. We await a further response. So, that’s all for now, folks, but do respond where you can, do let us know your views and do tell us about any consultations we aren’t aware of.